annual fuel utilization efficiency (AFUE): an efficiency descriptor of the ratio of annual output energy to annual input energy as developed in accordance with the requirements of U.S. Department of Energy (DOE) 10 CFR Part 430.
automatic control device: a device capable of automatically turning loads off and on without manual intervention. balancing, air system: adjusting airflow rates through air distribution system devices, such as fans and diffusers, by manually adjusting the position of dampers, splitter vanes, extractors, etc., or by using automatic control devices, such as constant air volume or variable-air-volume (VAV) boxes. using automatic control devices, such as automatic flow control valves. ballast: a device used in conjunction with an electric discharge lamp to cause the lamp to start and operate under the proper circuit conditions of voltage, current, wave form, electrode heat, etc. 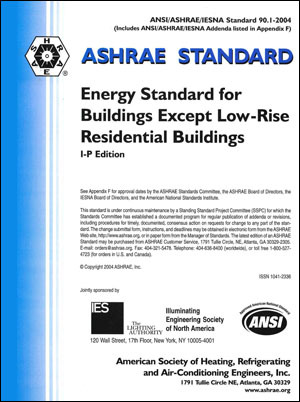 baseline building performance: the annual energy cost for a building design intended for use as a baseline for rating above standard design. budget building design: a computer representation of a hypothetical design based on the actual proposed building design. This representation is used as the basis for calculating the energy cost budget. C-factor (thermal conductance): time rate of steady-state heat flow through unit area of a material or construction, induced by a unit temperature difference between the body surfaces. Units of Care W/m2·K. Note that the C-factor does not include soil or air films. floor, opaque door, vertical fenestration, or skylight. units, for a complete refrigerating system or some specific portion of that system under designated operating conditions. coefficient of performance (COP), heat pump-heating: the ratio of the rate of heat delivered to the rate of energy input, in consistent units, for a complete heat pump system, including the compressor and, if applicable, auxiliary heat, under designated operating conditions. continuous insulation (c.i. ): insulation that is continuous across all structural members without thermal bridges other than fasteners and service openings. It is installed on the interioror exterior or is integral to any opaque surface of the building envelope. cooling design temperature: the outdoor dry-bulb temperature equal to the temperature that is exceeded by 1 % of the number of hours during a typical weather year. rejection systems such as cooling towers. dead band: the range of values within which a sensed variable can vary without initiating a change in the controlled process. the degree-days over a calendar year. between the mean temperature for the day and 18°C. degree-days over a calendar year. air intake below design rates when the actual occupancy of spaces served by the system is less than design occupancy. design capacity: output capacity of a system or piece of equipment at design conditions. maintained by a system and under which the system must operate. design energy cost: the annual energy cost calculated for a proposed design. direct digital control (DDC): a type of control where controlled and monitored analog or binary data (e.g., temperature, contact closures) are converted to digital format for manipulation and calculations by a digital computer or microprocessor, then converted back to analog or binary form to control physical devices. supply outdoor air to reduce or eliminate the need for mechanical cooling during mild or cold weather. by heat or mass transfer to the environment without the use of mechanical cooling. efficiency: performance at specified rating conditions. and under the same conditions. energy cost budget: the annual energy cost for the budget building design intended for use in determining minimum compliance with this standard. energy factor (EF): a measure of water heater overall efficiency. performance factor for the base design. envelope performance factor for the proposed design. F-factor: the perimeter heat loss factor for slab-on-grade floors, expressed in W/m·K. fan system input kilowatts [kW]: the sum of the fan input kilowatts (kW) of all fans that are required to operate at fan system design conditions to supply air from the heating or cooling source to the conditioned space(s) and return it to the source or exhaust it to the outdoors. fan system design conditions: operating conditions that can be expected to occur during normal system operation that result in the highest supply airflow rate to conditioned spaces served by the system. fan system motor nameplate kilowatts: the sum of the motor nameplate kilowatts (kW) of all fans that are required to operate at design conditions to supply air from the heating or cooling source to the conditioned space( s) and return it to the source or exhaust it to the outdoors. floor area, gross: the sum of the floor areas of the spaces within the building, including basements, mezzanine and intermediate-floored tiers, and penthouses with a headroom height of 2.3 m or greater. It is measured from the exterior faces of exterior walls or from the centerline of walls separating buildings, but excluding covered walkways, open roofed-over areas, porches and similar spaces, pipe trenches, exterior terraces or steps, chimneys, roof overhangs, and similar features. the building envelope, but excluding slab-on-grade floors. and to automatically close the flue outlet when the appliance is in a standby condition. heat capacity (He): the amount of heat necessary to raise the temperature of a given mass 0.56°C. Numerically, the He per unit area of surface (kJ/m2’K) is the sum of the products of the mass per unit area of each individual material in the roof, wall, or floor surface multiplied by its individual specific heat. heating design temperature: the outdoor dry-bulb temperature equal to the temperature that is exceeded at least 99.6% of the number of hours during a typical weather year. heating seasonal performance factor (HSPF): the total heating output of a heat pump during its normal annual usage period for heating (in Wh) divided by the total electric energy input during the same period. high-frequency electronic ballast: ballasts that operate at a frequency greater than 20 kHz. infiltration: the uncontrolled inward air leakage through cracks and crevices in any building element and around windows and doors of a building caused by pressure differences across these elements due to factors such as wind, inside and outside temperature differences (stack effect), and imbalance between supply and exhaust air systems. installed interior lighting power: the power in watts of all permanently installed general, task, and furniture lighting systems and luminaires. integrated part-load value (IPLV): a single-number figure of merit based on part-load EER, COP, or kW/ton expressing part-load efficiency for air-conditioning and heat pump equipment on the basis of weighted operation at various load capacities for the equipment. isolation devices: devices that isolate HVAC zones so that they can be operated independently of one another. Isolation devices include, but are not limited to, separate systems, isolation dampers, and controls providing shutoff at terminal boxes. lighting power allowance: interior lighting power allowance: the maximum lighting power in watts allowed for the interior of a building. exterior lighting power allowance: the maximum lighting power in watts allowed for the exterior of a building. lighting power density (LPD): the maximum lighting power per unit area of a building classification of space function. mean temperature: one-half the sum of the minimum daily temperature and maximum daily temperature. metering: instruments that measure electric voltage, current, power, etc. motor power, rated: the rated output power from the motor. nameplate kW: the nominal motor kW rating stamped on the motor nameplate. nameplate rating: the design load operating conditions of a device as shown by the manufacturer on the nameplate or otherwise marked on the device. non-recirculating system: a domestic or service hot-water distribution system that is not a recirculating system. nonstandard part-load value (NPLV): a single-number part-load efficiency figure of merit calculated and referenced to conditions other than IPLV conditions, for units that are not designed to operate at ARl Standard Rating Conditions. optimum start controls: controls that are designed to automatically adjust the start time of an HVAC system each day with the intention of bringing the space to desired occupied temperature levels immediately before scheduled occupancy. overload, short circuit, or ground fault. a single room or zone. joint service between two buildings. infrared (IR) transmission, and/or ultraviolet (UY) energy. consumption or release of process energy. calculated for a proposed design. for calculating the design energy cost. exchanger) and return it to the source. than 50%) by infrared radiation. resistance of other building materials or air films. temperature) or mechanical (recirculation pump). heated by a mechanical heating system. to the SEER but in SI or other consistent units). the HSPF but in SI or other consistent units). input during the same period (in Wb). include interior, exterior, or integral shading devices. then re-radiated, conducted, or convected into the space. output capacity exceeds 15 W/m2 of floor area. equal to the criteria in Table 3.1.
exceeding 3 ach (e.g., atria). provides illumination for visual tasks. contiguous to be combined within a single thermal block. electric power from one voltage to another voltage. and coils are in a gaseous or dry compound. the core and coils are immersed in an insulating liquid. environments on each side. Units of U are W/m2·K. outside of the thermostat set point range. a heating function are also included. the volumetric flow of heated or cooled supply air to the space. is in a standby or shutdown condition.